"We as a club must be satisfied with the ECLW season, semi-final is always our minimum goal, on one side we lost more matches than expected but we had also massive problems with injuries on the other side. We had to accept that Sofia POLCANOVA was at no point 100% fit, starting with the European Championships in Alicante 2018, where she had success for Austria, but three events at one tournament are too much. 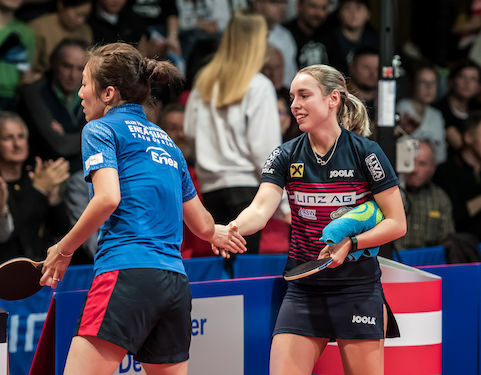 We as a small table tennis club are happy that we fixed her physical problems with the genius Franz LEBERBAUER (physiotherapist RB LEIPZIG and Red Bull Salzburg Academy) and we hope next season will also be her top season for the club of LINZ AG FROSCHBERG," stated RENNER. "The most impressive player this year was Linda BERGSTRÖM, third year in LINZ, who proved her quality to her sceptic, she showed that with determination and hard work everything is possible. As a complete team we never competed at our best this season, but we reached the minimum goal. The spectators helped us a lot this year, we had some sold out events, what is not a matter of course. We are sure that our club proved again its value for the European women table tennis in general, for the league and for the future of it also."